Like a compass navigating cinemagoers to one magnetic point, The Avengers proved to be Marvel Studio’s magnum opus last year and validated their compiling of beloved heroes under one narrative umbrella. However, time waits for no one, and with Iron Man 3 acting as the starting point for the studio’s Phase 2 this month, Marvel’s work is far from over. Rather, it’s just beginning, and that’s something Christopher Markus and Stephen McFeely – the writers behind Captain America: The Winter Soldier – know all too well. 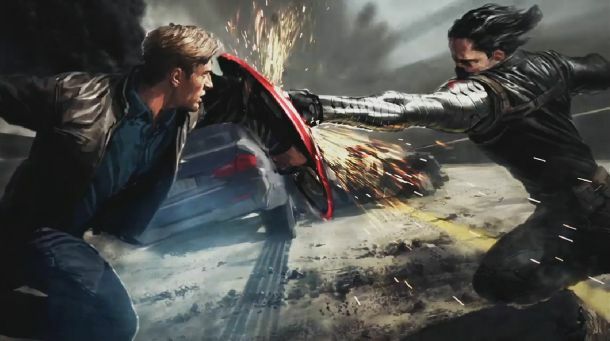 Scouring over their answers, it’s clear that Steve Rogers will be the crux of Captain America: The Winter Soldier. Set in the modern day, it will continue to explore Chris Evans’ character as a man-out-of-time and his struggles to assimilate with the 21st century. With Scarlett Johansson confirmed to return as Black Widow, the two must join forces to combat a formidable threat facing Washington D.C.
We can expect the mysterious S.H.I.E.L.D agent – A.K.A Natasha Romanoff – to provide an interesting juxtaposition with Chris Evans’ star spangled hero – after all, modern, astute and ruthless aren’t exactly qualities that one associates with Cap. First published in 1941, Captain America has always retained a place in the public sphere and now, as Marvel Studios’ reputation continues to grow, the Super Soldier has become a cornerstone in cinema’s superhero culture. Joining Chris Evans and Scarlett Johansson, Sebastian Stan will return as fan-favourite Bucky Barnes – who has a bigger part to play in the sequel – alongside Anthony Mackie, Cobie Smulders and Samuel L. Jackson. The film will be directed by Anthony and Joe Russo and marches proudly into theaters April 4th, 2014. Are you looking forward to Captain America: The Winter Soldier? Will the film attract a substantial audience in the aftermath of The Avengers? Let us know what you think in the comments!